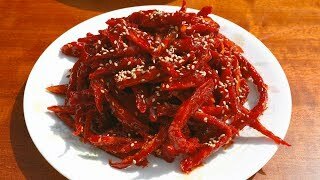 Today I’m going to show you my recipe for dried shredded pollock seasoned with hot pepper paste. I’ve been making this for a long time and everyone loves it. It’s sweet, spicy, juicy sauce covering light, dried flaky fish. Called Bugeopo gochujang-muchim in Korean, it’s a great side dish for rice and can be kept in the fridge for a long time, up to one month. It’s a kind of preserved side dish called mitbanchan. The main ingredients are dried pollock and gochujang. I’ve always wanted to make a video in Sunchang, Korea, because it produces the best of best gochujang (Korean hot pepper paste) in the whole country. It was considered a regional specialty as far back as the Joseon dynasty (1392-1910) when it was regularly sent to the king’s palace for his meals. I used to live in the city of Gwangju, near Sunchang, so I had been there many times to buy gochujang. Since then they’ve built a little village just for gochujang artisans. Before that they were scattered here and there but now they’re all in one spot. In the Korean grocery store you might see “Sunchang gochujang” on the label of a tub of gochujang, but that’s different. The real Sunchang gochuchang is homemade and different from house to house. You have to go to Sunchang to taste it, it’s not sold anywhere else. They also make doenjang (Korean fermented soybean paste) and jangajji, and one of the most well-known is gulbi-jangajji, made with yellow corvina fish (remember my grilled yellow corvina recipe?). When you serve gulbi-jangajji at a party, everyone will want to try it! My bugeopo gochujang-muchim is similar to gulbi-jangajji but made with ingredients you can find in a Korean grocery store almost anywhere. I think it tastes better. If you go to Korea I suggest you make a stop there and taste some of their wonderful deep-flavored gochujang. But you don’t need it to enjoy this recipe! I always make it with store bought gochujang and it’s a big hit! Combine garlic, gochujang, rice syrup, sesame oil, and vegetable oil in a large bowl. Mix it well with a wooden spoon until the gochujang is not separated with the oil and well incorporated. Set aside. Open the package of pollock. Put it on a platter or your cutting board and check each piece for fishbones. If you find any, pull them out and throw them away. Put the dried pollock into a plastic bag. Add ¼ cup water evenly to the pollock and close the bag. Grab the bag with one hand to seal it, and mix and massage the pollock with your other hand so that it moistens evenly. Let it sit for 10 minutes. Pound the pollock in the plastic bag with a pestle or any object like a rock, bottle, or rolling pin for about 1 minute, to soften the pollock and make it flaky. Add the pollock to the seasoning paste in the bowl. Mix it well and sprinkle the sesame seeds over top. Transfer it to an air-tight container. Put some into a small plate and serve with rice. You can refrigerate it for up to 1 month. Posted on Wednesday, June 13th, 2018 at 9:58 pm. Posted July 15th, 2018 at 7:59 pm | Log in to reply. When I saw this recipe I remembered that I had bought some dried shredded squid with no clear idea of how I was going to use it. All I did was substitute the squid for the pollack. Delicious! Thank you. You’re a wonderful teacher! Posted July 6th, 2018 at 10:07 pm | Log in to reply. Posted July 11th, 2018 at 8:56 am | Log in to reply. Yes, I hope that many people learn about Korean cooking and ingredients through my recipes! Let me know how your dish turns out! Posted June 26th, 2018 at 5:51 am | Log in to reply. Maangchi this sounds delicious! Thank you so much. How hot is the chill paste? I’ve never tried gochujang before. Posted June 26th, 2018 at 3:07 am | Log in to reply. This is very similar to the shredded squid recipe. It looks delicious! Posted June 28th, 2018 at 7:56 am | Log in to reply. Yes you are right! the only difference is that I pound this fish to get a flaky texture. Posted June 25th, 2018 at 9:06 am | Log in to reply. A dried pollock pollack salty? Posted June 20th, 2018 at 7:18 am | Log in to reply. Oh my! Here in Iceland we have “harðfiskur” (hard fish) which is dried fish that has been prepared similarly as your pollock it seems. We mostly use haddock or cod. We just eat it as a snack, often with butter. Is your dried pollock a bit salty to taste when it is eaten uncooked? I’ve never ever thought of using harðfiskur in cooked meals. I wonder if I can use it instead of Korean dried pollock. Here is an example of our dried fish. Posted June 28th, 2018 at 7:42 am | Log in to reply. 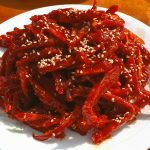 Shredded dried pollack is just a little salty, and we usually eat it by itself or dip it in gochujang. It goes well with beer. If your harðfiskur is naturally salty with no added salt, you can use it in this recipe. Posted July 4th, 2018 at 5:24 am | Log in to reply. Posted June 19th, 2018 at 3:16 am | Log in to reply. Thaaank you for this recipe Maangchi! You are always the best! A few days ago I bought dried pollock because my husband told me he really likes it but I had no idea how can I prepare it. Of course, I decided to check your site and there was only dried pollock and radish soup. I made soup and it was awesome, and then you post this recipe! I think you read my mind! This is great! And my husband was shocked that I made this side dish! PS. Are you in Korea now? Did you think about organizing a meet up with your fans in Korea? Every foreigner I know, who live in here, loves you!! Posted June 19th, 2018 at 8:01 am | Log in to reply. I’m glad you like this recipe! Good luck with your Korean cooking. Posted June 20th, 2018 at 12:28 am | Log in to reply. This recipe was originally posted on June 13, 2018 at 9:58 pm by Maangchi. The video was watched 240,400 times on YouTube & has 8,062 likes!